In Kolarac Endowment on September 29th, a new concert season was announced and it was said that funds were provided for the purchase of a new piano. Gathered at the press conference were greeted by Jasna Dimitrijević, General Manager of The Kolarac Endowment, followed by speeches of Ana Simić Pavlović from Telekom Srbija and Mirjana Lazarević, The Music Centre Manager of The Kolarac Endowment. Ana Simić Pavlović said that this year’s program is extraordinary. “There are quite enough instruments of piano, violin, and special accent and pleasure to me will be that I will have the opportunity to hear Ivo Pogorelić live. Enjoy our World of Music and see you at concerts, “she said. 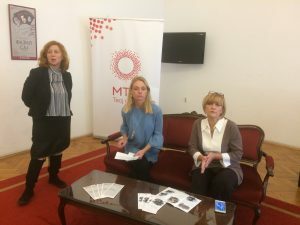 Mirjana Lazarević expressed her gratitude to representatives of MTS as well as representatives of The Ministry of Culture and The City Secretariat for Culture which supported Music Centre’s programs. Lazarević pointed out that funds were provided for the purchase of a new piano. “The news is that funds have been provided for the purchase of the new Steinwey, that the piano will be selected by Ivo Pogorelić and that the piano will be in our hall by the end of the year. We do not know the exact date, the delivery date does not depend on us. However, it’s a great news that we have collected funds for the purchase of piano from part of the donations, and the rest in the Ministry of Justice competition, “she added. Announcing the third season of Kolarac cycle your music world, organized by the Music Center in cooperation with MTS, Mirjana Lazarević said that the Belgrade audience will have the opportunity to listen to five exceptionally exclusive and varied concerts. From the vocal ensemble that performs early music, through the soloist performance of Ivo Pogorelić, the traditional concert by Nemanja Radulović and the classical piano trio, to the controversial violinist Gilles Apap who crosses musical directions and styles with the duo Meduoteran. After almost 30 years since the last performance at Kolarac, one of the most important pianists of today, Ivo Pogorelich, returns to Belgrade. Exclusive solo performance of this renowned pianist arouses great public attention from around the country and will for certain be one of the most significant music events in 2017. Nemanja Radulović and the DoubleSens are marking two birthdays on this Concert – traditionally the Day of The Concert Hall of Kolarac Endowment and the 10th Anniversary DoubleSens. Before Belgrade, the same concert will take place in Paris, so that the orchestra, which consists of musicians from France and Serbia, mark this jubilee in two places, and Nemanja, as well as many previous years, performs on a celebration on February 4th. The specialty of this concert is that this will be the promotion of the new compact disc that was recorded for the Deutsche Gramophon in the Concert Hall of the Kolarac Endowment and whose release is expected in the autumn of 2017. The piano trio led by our celebrated violinist, Sreten Krstić, who is the concert master of the Munich Philharmonic Orchestra, is performing for the first time in Belgrade with an extraordinary interesting and rarely performed program. Apap’s interpretations are going from classical to popular music, famous Yehudi Menuhin, his professor, described him as a “prototype” of a 21st century violinist because he became famous combining a classic repertoire with different music styles of traditional melodies from different region worldwide. In cooperation with Duo Meduoteran that consists of accordion and baglama, the audience experience unique crossing of music styles, directions and music themes.